dealGPS, sales software for sales professionals. As a B2B sales professional you will be guided through the structured and intuitive sales process with smart actions to help you win deals. 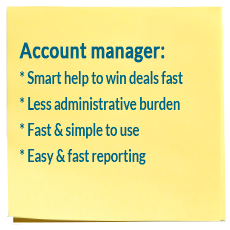 Our DEAL EXPERT DATABASE, provides you with proven insights and actions to help you win more deals in less time. dealGPS makes reporting fast and simple. Administrative duties will be reduced to a minimum and you can spend your valuable time with customers to pursue new business opportunities. 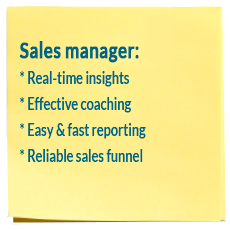 As a sales manager you will gain valuable insights into the activities and performance of your team. 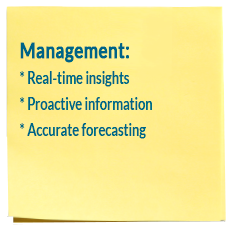 You have instant access to detailed activities and real-time information of each team member. This enables you to proactively coach them on issues that matters. It also provides you with visual and analytic management components and critical alerts to quickly help you understand what is and what is not working. Management reporting focuses on conformance to best sales practices, so you can now use your valuable time to coach, motivate and lead each team member to peak performance. Your pipeline and forecasting information are accurate, which makes it fast and easy to satisfy the needs of your CFO and other senior executives. As a member of the Management Team you will get reliable, real-time and high-quality information about your sales operation and the status of your sales performance. Unlike other systems you look forward instead of into the rear-view mirror. The profound and accurate information in dealGPS will help you to make high quality and business critical decisions to proactively guide your organization in the right direction. As a sales trainer you will have a key role in the sales strategy and results of the company. By integrating and implementing your training methodology and tools into dealGPS, you will be sure that the lessons learned will stick and will be used during the day-to-day sales planning and sales review process. In addition, dealGPS enables you to identify individual strengths and weaknesses which will help you be more focused with your training and coaching. 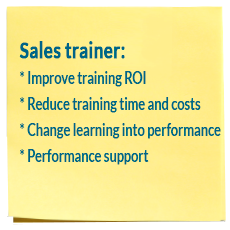 Therefore you can reduce training costs and time and improve time to peak performance of the sales people. In brief, you will be seen as a profit generator rather than a cost centre officer. Call: +31(0)88-2733678 or send a message. *Required field. *Check your input *Required field. *Check your input *Required field. *Give a valid phone number. *Required field. *Give a valid email address. *Required field. *Your question or message is too short. Check your input. Your question or messge has been sent. We will contact you a.s.a.p..